The thing to note about the newest Mario game is that, while it is technically a 3D game, it would be more accurate to say that this is an old school side scroller with a z-axis. 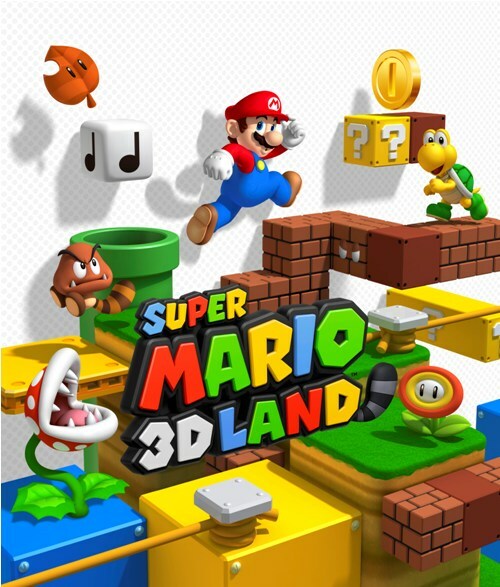 Were it not for Mario’s ability to run into the background, 3D Land would be an exact installment in the retro New Super Mario Brothers franchise, complete with three golden coins hidden in each stage for the obsessive compulsives to hunt down. Beyond that faint whiff of side quest, it’s a very businesslike game, all Point A to Point B and very little world exploration. I’d call this the spiritual successor to Super Mario Brothers 3, especially considering the direct lifting of the flight-granting raccoon suit from that game. I’ve always kind of loathed the platforming aspects of 3D Mario games, since it can be hard to gauge where one is landing. 3D Land does a great job of handling this problem, as one isn’t required to perform any exotic angled leaps and Mario’s shadow is always in view. If the latter wasn’t true, the game would be impossible. By having the stages run on more or less fixed pathways, the camera isn’t given the freedom to go haywire and wreck the gameplay. In a 3D game, this is really remarkable. What is kind of nice is that, following the short conflict between Mario and the King of the Koopas, the game doubles in size and allows the player to run through a series of remixed stages which ramp up the difficulty to a significant degree. Some of these special stages are simply new layouts, but many of them also feature the added challenges of having only 30 seconds on the clock and/or a treacherous little shadow version of Mario chasing him through the stage and trying to do him in. The exploration factor decreases even further at this point, and the change in pace from leisurely to frantic kicks up the excitement. I know that there’s a school of gaming that professes that if you’re not spending a hundred hours engaged in a game’s repetitive and pointless side quests, you’re not getting your money’s worth. A tireless player can achieve everything there is to achieve in 3D Land in a couple of sittings, and the game is 40 bucks, and it’s worth every penny. This is the year’s purest example of a game being allowed to simply be a game, and the result is a lot of quick, easy fun.